Enjoy your meals in Flindor Cottage’s beamed dining room around a magnificent oval oak table with a roaring open fire in the colder months. Breakfast choice is extensive, with a different ‘special’ cooked choice offered every day, such as grilled cold smoked whiting topped with poached egg and hollandaise sauce. Each breakfast is complemented with a wide choice of teas and coffees. Most produce is sourced locally wherever possible, including the free range bacon and sausage from the next door village, Helmingham, and eggs from a neighbouring farm in Framsden. Jams are homemade and the honey is from Framsden hives. We are happy to offer evening meals, which will give you the chance to savour some of the outstanding wines from the cellar. How about a sumptuous Sauternes with foie gras de canard followed by an elegant 2003 claret with Framsden lamb, or a bold Rioja Gran Reserva with tapas and a paella mixta? Then finish off with local Suffolk cheeses and a glass of Taylor’s 1977. 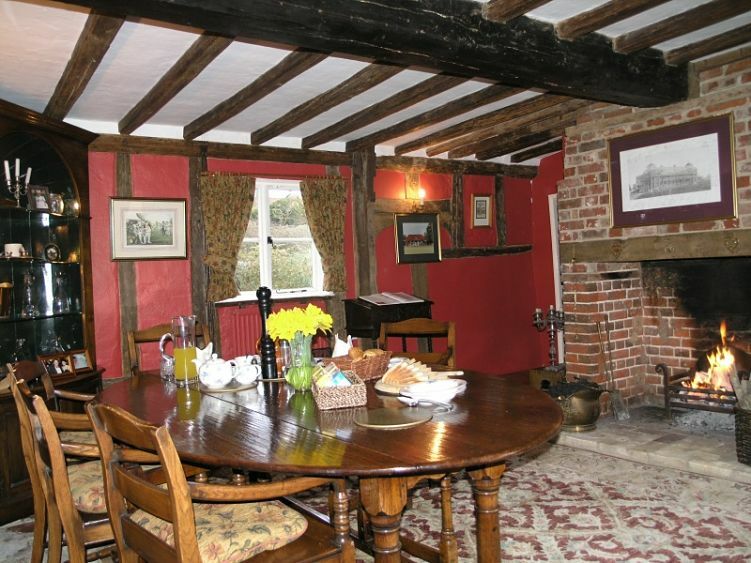 Alternatively, a short drive from Flindor Cottage to Cretingham is the traditional village pub, The New Bell Inn, offering fine ales, good food and a welcoming open fire in the winter.